Easy2Sync can check at regular intervals if a certain folder, computer or drive is available. As soon as this is the case (and an optional waiting period has passed to make sure the device really is ready) a sync will be started. The sync will not be started again while the device is present. Only after it was not available and then is detected again another sync will be started. 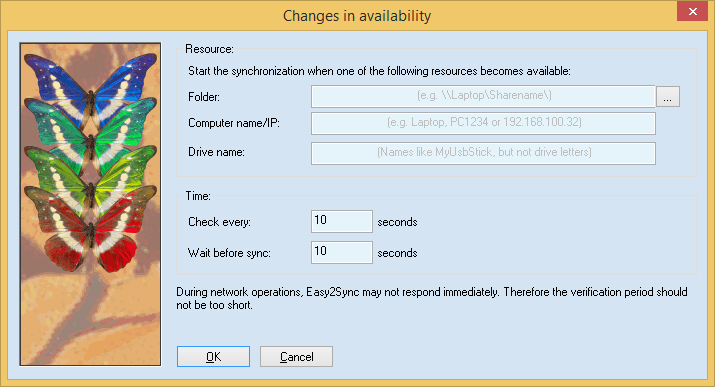 While checking network resources Easy2Sync may fail to react for a few seconds. Therefore the checking period shouldn't be made too small.